The Renoir copper kitchen sink is a perfectly designed undermount kitchen sink designed for smaller kitchens. Do not be fooled by the affordable price of this kitchen sink. The Renoir is handmade from the purest 16 gauge solid copper by highly skilled artists. Featuring a Lifetime Warranty, copper sinks from Sinkology are designed and crafted to last a lifetime. The hammered antique copper finish is durable, easy to maintain and brings the warmth of copper into any home. Function and simplicity combined result in Ancona's Capri Series Undermount Single bowl sink, the ideal addition to improve any kitchen. Compact and elegant, this Undermount sink features an ample 21 inch bowl, perfect for all household cleanup tasks. Accommodating to most counters and cabinets, the middle position drain allows better distribution and flow of sink. Fabricated in stainless steel, its satin finish and subtle curves blends into any kitchen scheme, while adding a beautiful and reliable construction to your home. This Strive kitchen sink offers professional style with easy-to-clean curved corners. Made of thick, premium quality 16-gauge stainless steel, this 29-inch medium-sized sink offers unique dimensions that maximize the available basin space in a 30-inch cabinet. Strive features a sound-absorption system that significantly reduces disposal and dishwashing noise. This sink includes a combination dishcloth bar/utility shelf to organize dishcloths, scrubbers, and sponges, and a bottom sink rack to help prevent scratches. 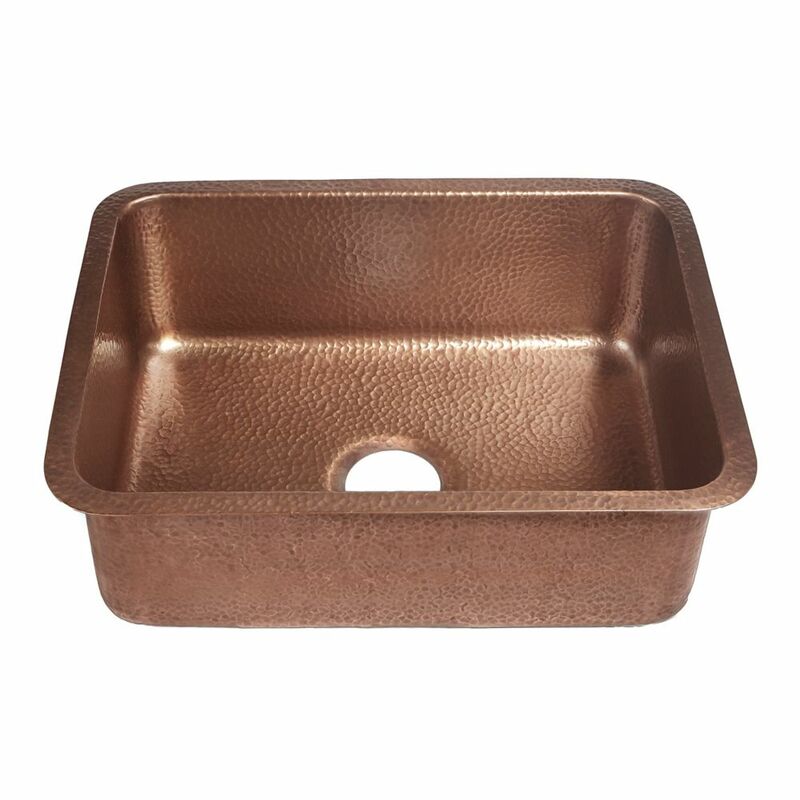 The Adams farmhouse single bowl apron front copper sink from SINKOLOGY is a throwback that harnesses old-world craftsmanship to produce unmatched beauty and robustness. Each sink is handmade with textured 16-Gauge pure solid copper by skilled artisans who meticulously forge a classic fixture to give your kitchen a distinctive focal point. The large 33-inch single-bowl design offers plenty of space to prep meals or clean dishes and the centrally located drain hole accommodates a separately sold strainer drain basket or InSinkErator garbage disposal. The apron wraps 2-1/2-inch on each side, allowing for flexible undermount, built-up or flush installation. Renoir Undermount Handmade Solid Copper 23 in. Single Bowl Kitchen Sink in Antique Copper The Renoir copper kitchen sink is a perfectly designed undermount kitchen sink designed for smaller kitchens. Do not be fooled by the affordable price of this kitchen sink. The Renoir is handmade from the purest 16 gauge solid copper by highly skilled artists. Featuring a Lifetime Warranty, copper sinks from Sinkology are designed and crafted to last a lifetime. The hammered antique copper finish is durable, easy to maintain and brings the warmth of copper into any home. Renoir Undermount Handmade Solid Copper 23 in. Single Bowl Kitchen Sink in Antique Copper is rated 4.8 out of 5 by 17. Rated 5 out of 5 by 124 from Love it!... Love it! Rated 5 out of 5 by Diana from Love it! It is so beautiful and unusual and adds a real warmth to the kitchen decor. Everyone comments on it. Rated 5 out of 5 by Denise from The sink is not installed yet as we are waiting for the countertops. The quality of the sink for ... The sink is not installed yet as we are waiting for the countertops. The quality of the sink for the price is amazing. It's perfect for household use and I would have had to pay a lot more money to get something similar. Rated 5 out of 5 by HomeDepotCustomer from A solid sink, we used it as a countertop one.... A solid sink, we used it as a countertop one. Looks pretty and the thickness of the metal is very substantial. Weighs accordingly. Rated 5 out of 5 by Osiris from Couldn’t be any happier. Actually considering replacing both bath’s sinks... Couldn’t be any happier. Actually considering replacing both bath’s sinks to SINCOLOGY.